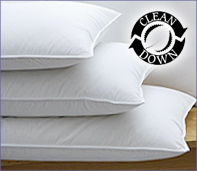 Natural goose down pillows will add an incomparable level of comfort and luxury to your sleeping experience. Down pillows vary greatly in quality. In searching for a good quality down pillow, one must first understand fill power. Fill power relates to the size of the down cluster, loft and quality itself. Larger down clusters come from more mature birds. The larger the cluster the more air the cluster will trap, resulting in higher loft. The higher the fill power, the higher the quality NOT the firmness. For example, an 800 fill power does not yield a firmer pillow then a 600 fill power. Fill power is the measure of space (in cubic inches) that an ounce of down creates when allowed to reach its maximum loft. Down fills are typically rated on a scale from 550 to 800 +, with 650 to 750 being of high quality, with 800 and higher being the best. Typically, the higher the fill weight of a pillow, the heavier the pillow. Duck down tends to be of lower quality than goose down, with the exception of the down from the Eider duck found in the arctic. 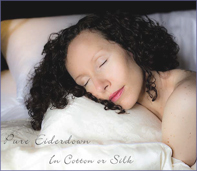 Eiderdown is considered the highest quality down, available worldwide. OBS recommends that when searching for the perfect pillow, one is to keep in mind that not all down is the same. With 70% of down today coming from China, derived mainly from ducks, awareness of difference is key. Duck down is generally less expensive than goose down and that is simply because the worldwide supply of duck down far exceeds that of goose down. Hypo-Cycle™ Europe Down Fill is Sterilized, 4-cycle Wash Process, Oko-Tex Leak-free Down Proof Fabric. Hand Made To Order, The Softest Sleeping Pillows in the World, Finest Materials and Craftsmanship, Soft, Medium or Firm.